Star: Susan Sarandon, Gil Bellows, Topher Grace, Christopher Heyerdahl. The small, Canadian town of Fort Dundas isn’t so much sleepy as catatonic. This may explain why its top cop, Inspector Hazel Micallef (Sarandon) has a drinking problem, though living with her mother likely doesn’t help. The tedium is relieved when the body of an elderly woman turns up, with her throat sliced wide-open and her face carefully posed for the rigor mortis to take hold. As Micallef points out, this didn’t feel like a first attempt, and as she and colleague Ray Green (Bellows) dig in, they find other cases, scattered across Canada with similar elements. Guess there’s a Canuck serial killer aboot, eh? 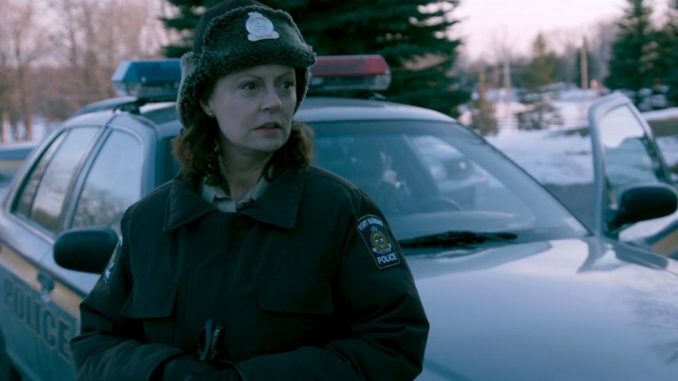 More than an element or two of Fargo here, with its peacefully snowy small town, doggedly determined female cop and equally purposeful killer. I’m not sure the storyline quite matches the Coen Brothers’ classic. We discover the motive, thanks to visiting a priest played by Donald Sutherland, and who might as well be named Father Exposition. Turns out the killer, calling himself Simon (Heyerdahl – and, yes, he is related to the rafting Norwegian), is carrying out a “Resurrection Prayer”. By taking the lives of a dozen, apparently willing victims, Simon believes he will gain the power to bring someone back from the dead. Yeah, that’s hints of Se7en you’re picking up as well, albeit with a kinder, gentler killer. Despite being rather too over-familiar, and ending in a way that feels more like a TV series pilot than a self-sufficient feature, this made for decent viewing. It’s success is mostly down to the performances, with Sarandon delivering a nicely complex lead role, as a woman who has known her share of suffering in the past. Heyerdahl is also very good; managing to be creepy and yet surprisingly sympathetic. I will admit to a grudging respect for the truly religious zealot, because they have a level of commitment to an abstract concept, which I just can’t seem to muster. Devotion to a person, hell, even a sports team is one thing. Devotion to an unproven supernatural construct from a couple of millennia ago? Well done! There were a few little things which stand out as well done. The detectives get help from Toronto, in the shape of young cop Ben Wingate (Grace). Turns out he’s gay. This is mentioned casually in one conversation, and his sexuality is then completely ignored for the rest of the movie. Which is exactly as it should be, because it is entirely irrelevant to the story the film wants to tell. Wingate isn’t a gay cop, he’s just a cop. However, the whole ends up being somewhat less than the sum of its parts. It isn’t too hard for an observant viewer to predict the specifics of the final confrontation, and since both the who and the why are never concealed, there aren’t many questions left for the film to answer. It does just about manages to skate by, on the merits of spending 100 minutes in the company of some fairly interesting characters.